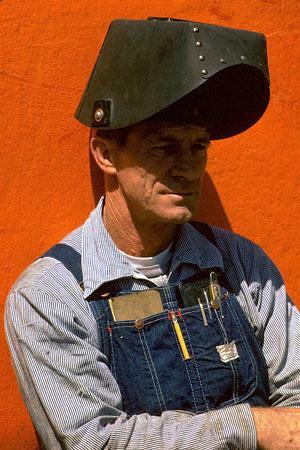 I first became aware of Bill Hocker's photography via a link on Jef Poskanzer's Industrial Archeology, a page I recommend to those with an interest in same as a central resource. In Jef's consistently terse style all he said was: "Bill Hocker's great industrial photos." I trust Jef like I trust few others online so that was enough for me. Clicking on his link to Hocker's Industrials I was prepared for something excellent and I was not disappointed. I was not, however, prepared for the vast array of pleasures that the rest of his site has to offer. Elegant and sparse in layout and presentation, Bill Hocker: Photographs is one of those rare sites where the visitor finds himself wandering from page to page and theme to theme with increasing pleasure. Through an all too rare meeting of taste with technical ability, Hocker's images from across many decades and through many countries, all seem as fresh as tomorrow and as solid as yesterday. Marked throughout by a quiet meticulousness and a dedication to visual acuity, this is one site you will not want to leave too soon. And one you'll want to return to as well. It only takes a minute to see that Hocker has a truly magnificent website. Thanks for the link.